On average, Fourth Amendment cases involving searches and seizures reach the Supreme Court more than once per year. This research looks at each Fourth Amendment case, reports how each Justice voted, then tallies the numbers for each Justice and graphs the results. The first graph covers seven cases that went to the current or most recent Court. The second graph looks at 26 cases since 1995. In typical Fourth Amendment cases reaching the Supreme Court, criminal defendants are caught doing something bad. They tend to be drug users or dealers and guilty as sin. These people do not receive much sympathy and they often get what they deserve. However, rules from these cases are then applied across the board to suspicious or even innocent citizens. For example, police stop a person and run an arrest warrant check without any legal authority to do so — with no “reasonable suspicion.” There is a warrant out, so police arrest the person and find drugs. If the search of this guilty person is legal, then a police officer may stop any innocent person at any time to run a warrant check — just because he feels like it. “Protectiveness” applies where the Court or a Justice protects citizens from searches and seizures by applying the Fourth Amendment right to the case. Since the Fourth Amendment permits police searches and seizures in cases that are “reasonable,” there is quite a bit of interpretive wiggle room. Every Fourth Amendment Supreme Court divided decision has two basic sides. In a divided case, some Justices come out for more protectiveness of people. The others come out for more deference to police authority. This always happens and the lines are easy to draw. Over time, overall scores of Justices reveal their general views. We can calculate a percentage and draw a graph. Since the beginning of the current configuration of the Supreme Court in 2009, there have been seven major Fourth Amendment cases with split decisions. One came in 2016 after the loss of Antonin Scalia. Four cases were decided by a single vote. Only two cases or 29 percent came out more protective of citizens. The Supreme Court has not been kind to the Fourth Amendment lately. 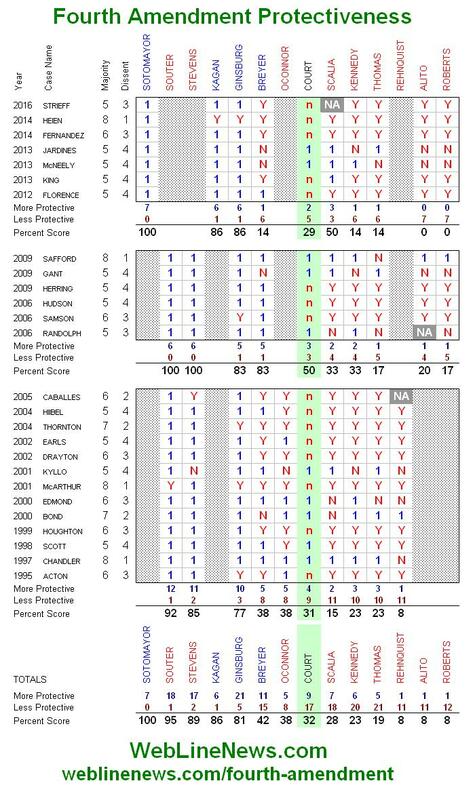 Ties in the current period are broken by looking at longer-term records (below). For example, Ruth Bader Ginsburg has a lower overall percentage of protectiveness than Elena Kagan. 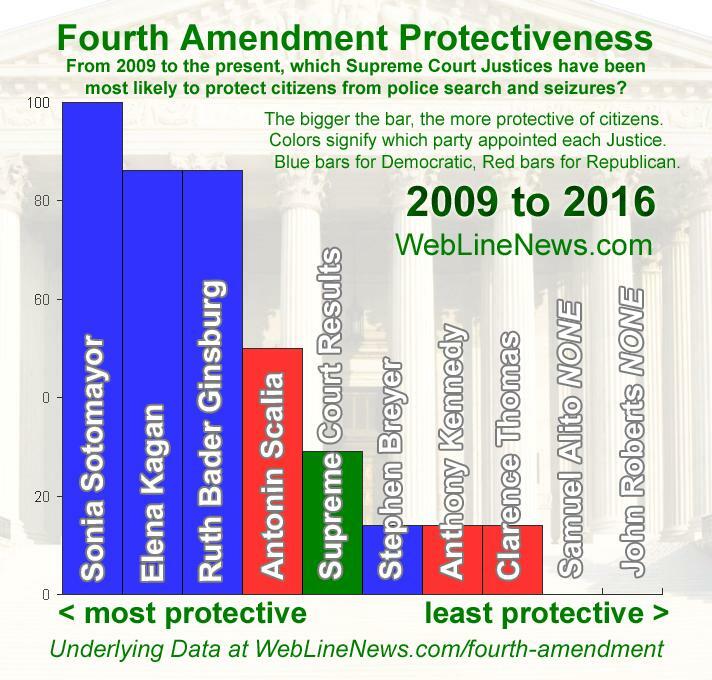 Recent Democratic appointee Sonia Sotomayor voted for protection in all seven cases while recent Republican appointees Samuel Alito and John Roberts voted for police power in every case since 2009. 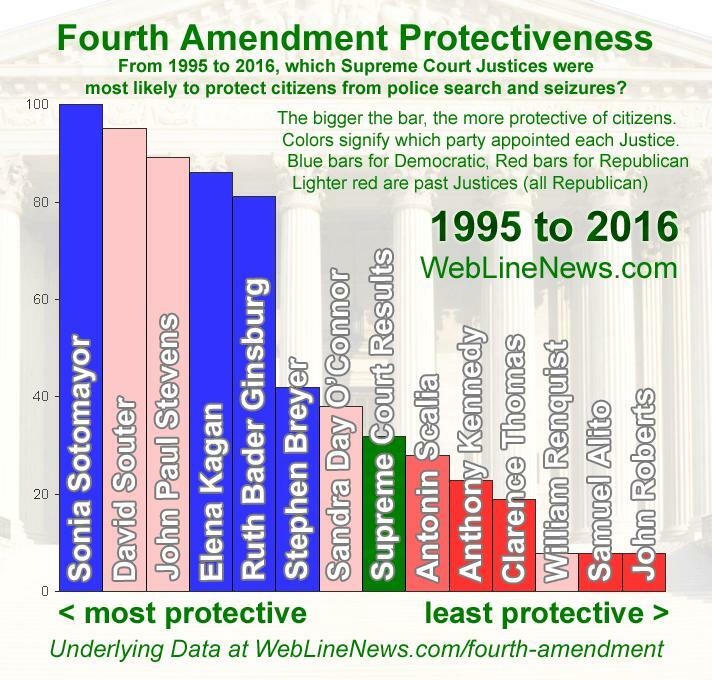 Republican appointee Antonin Scalia was the Fourth Amendment swing voter, while Democratic appointee Stephen Breyer voted with police as often as Republican appointees Anthony Kennedy and Clarence Thomas. Cases are highly factual, but here are some highlights from these seven cases. Read full cases for finer points. Fourth Amendment cases were not always so partisan as they are today. Expanding the period back to 1995 and adding four prior Justices, we see that the latest four appointments are near the edges. Ten of 26 cases were decided by a single vote. Only 32 percent of cases came out more protective of citizens, a bit higher than the above seven cases. Samuel Alito and William Rehnquist were exactly tied (8.3%). John Roberts was slightly lower (7.7%). Two Republican appointees, David Souter and John Paul Stevens, were very protective of citizens. If these two did not vote with the Democratic appointees, the overall protectiveness of the Court would have been much lower. Democratic appointee Stephen Breyer shifted toward police in the latest period, but he used to be more in the middle. Here are some basic highlights from more interesting cases. Here is the chart of details for all 26 cases. The chart includes the year of the case, a party to the case, the overall vote, and the vote of each Justice. The chart is broken into three periods with totals at the bottom. Justice names are colored blue for Democratic appointments, red for Republican appointments. More protective votes are marked with blue 1’s. Less protective votes are red. Letter Y means the case came out less protective, letter N means the case came out more protective. Editor’s note: a minor correction of an input error was made. Corrected totals moved Stevens ahead of Kagan in protectiveness. All others remain in the same order.